Who doesn’t love Strawberry Milk? If this was a favorite of your’s from childhood you may love it in a vape juice. This review is on the Mt. 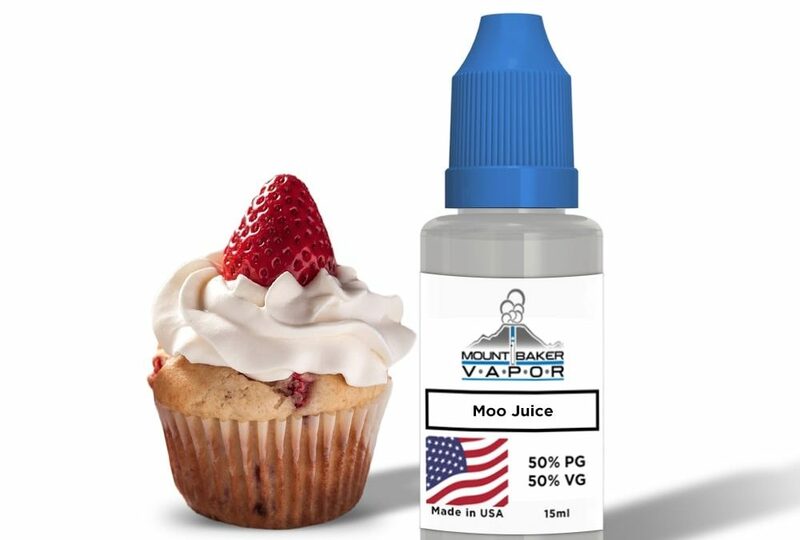 Baker Vapor flavor “Moo Juice” which is a rendition of an old-time favorite. Mt Baker Vapor starter as a brick and mortar shop in Lynden, Wa and later moved their operations to Mesa, AZ. 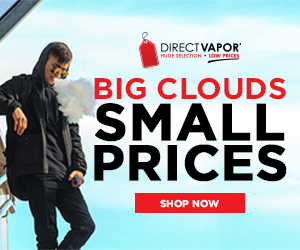 Their online shop carries a variety of e-liquids, vape gear, and accessories. They offer customized e-liquid blends with the ability to add extra flavor shots and a freebie flavor with “0” nicotine with every purchase over $15. I have been a long-time customer of Mt. Baker Vapor and love their customer service. I always get my orders within 2 – 3 days time and have never had a problem with missing orders. Mt Baker juices are designed to be affordable on any budget. A 30 ml bottle runs for $7.99 and the largest bottle is 240 ml for $39.99 for all of their “signature “ flavors. They also carry other premium e-juices for $19 – $22. Bottles of flavor shots are $4.99 and you can add as many drops as you like to increase the flavor of selected juices. I had bought some of this juice a while back when I first started out vaping. In fact, I think it was one of the first e-liquids I tried back then. I wanted to update my experience with this juice by trying it again now that I have been vaping a while and can compare it to some of the other juices I have tried since then. I am happy to say that the flavor has gotten better since that first bottle 3 years ago. The description for this product is taken from their website: “Moo Juice Vape Juice is the stunningly delicious flavor of fresh strawberries and sweet creamy pastries. One of our customer favorites!” And it certainly is, it is one of their best-selling products. The flavor I get from this e-liquid is a delicious strawberry and creamy milk flavor. I would describe it as more of a strawberry milk, than a strawberry pastry flavor. I don’t really taste the “pastry” flavor in it. I definitely taste the strawberry and the creamy flavor. I don’t taste anything like a muffin, cookie, or graham cracker type flavor. If it was designed to taste like a “pop tart”, it does not. But it does taste like strawberry milk which I love. The flavor is good, it just doesn’t resemble the description given. I get the sweet strawberry on the inhale, and the sweet cream on the exhale. I am using my Protank 2 with a 1.8 ohm coil at 10W to test this flavor. I increase the wattage to 15 which brings out more of the strawberry flavor but mutes the flavor of the cream. It is not overly strong, it’s a pretty mild flavor and the throat hit is determined by the nicotine content. I use 12mg so it’s a pretty decent throat hit for 12mg. This flavor is available in 0, 3, 6, 12, 18, and 24mg nicotine strength and formulated for 70PG/30VG to Max VG for RDA users. They also have a “Blue Moo” flavor which is supposed to taste like a blueberry muffin. I haven’t tried it yet but most likely it will be next on my list. I like blueberries so I’ll give it a try as well. The flavor is very subtle. I just read on another website that this flavor is supposed to taste like a strawberry muffin or tart. I am not getting a muffin flavor at all. I get a strawberry milk and that’s okay because I like it. I’ll continue to vape the rest of the bottle because it is a flavor I like. For someone really expecting the pastry flavor, you might not like that it is not there. Taste is subjective, so if not having that pastry flavor is a dealbreaker, then you might not like it. I have read complaints about MBV juices flavors being muted, but the trick is to let them steep a while longer. Depending on the flavor profile, some juices need longer steep time for the flavors to develop properly. If your juice has two or three different flavors it may just need a bit more time. Let it steep a while and try it again later. Single fruit flavors take the least amount of time to steep, while complex flavors like tobaccos take 2 weeks or more to develop. A good rule of thumb is if it tastes too light put it up on the shelf for a day or two and try it again. The longer it steeps the stronger the flavor will be. If you get a juice that just doesn’t improve with steep time contact customer service and let them know. They are really good at solving issues and they’ll be more than happy to make it right. I’ve had nothing but good experiences with them since 2015. I have ordered quite a lot of stuff from them in the past and it’s not uncommon to just get a bad batch of something. As far as vapor production, I always order my juices in 30/70 or Max VG for bottom-feed coils and RDAs. The vapor production of juices with a higher VG proportion is always better. In my Protank 2 I got some nice vapor clouds, and then tried a couple drops on my Dead Rabbit RDA and the clouds were much bigger but the higher nicotine hurt my throat on with the low resistance coils on the Rabbit. Moo Juice does produce a good amount of vapor on a variety of atomizers. The prices for this flavor and others at Mt. Baker are pretty cheap at $7.99 for a 30 ml bottle of Mt. Baker’s house specialty. They have larger sizes available up to 240 ml for less than $40 and a bunch of premium favorites from other brands as well. I love their pricing and I think it’s great for new vapers just starting out who don’t have a lot of money to spend on e-liquids and vaping supplies. I like this juice and would order it again. It has a nice flavor, not too sweet, and comes in large bottles since I go through a lot of juice. I’ve been a long-time customer of this company and highly recommend their products based on quality, affordability, and great customer service.